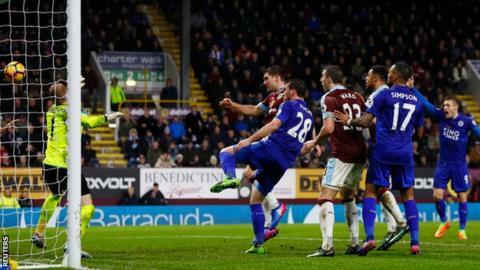 Burnley secured their fifth consecutive home Premier League win with victory over Leicester at Turf Moor, thanks to Sam Vokes' late goal. The Clarets dominated for long spells but routinely failed to hit the target until substitute Vokes hooked in Michael Keane's knock-down from a corner in the 87th minute. The ball hit Vokes' hand before he turned to score but referee Mike Dean dismissed Leicester's appeals for the goal to be disallowed. Claudio Ranieri's side remain without an away Premier League win this season - they also failed to score for a fourth consecutive league game. The Foxes now have the worst record after 23 games by a reigning top-flight title-winning club, eclipsing the Ipswich side of 1962-63. Burnley's first victory over Leicester since August 2010 also means Sean Dyche's side have won a fifth straight home top-flight game for the first time since 1966. Burnley showed once again why they are imposing hosts, with Arsenal's defeat to Watford ensuring the Clarets now have the third-best home record in the Premier League behind Chelsea and Tottenham as they moved ninth overall. Although their away form remains poor - like Leicester they are yet to win on the road this season - their combination of defensive solidity and the attacking options provided by Andre Gray, Ashley Barnes and Vokes at home could steer them to guaranteed safety this season before long. They had luck on their side here too, with Dean and his assistants ruling that Vokes did not intentionally handle the ball as Keane's header fell to him, a decision that will continue to incense Leicester. Yet in truth, the Clarets should not have had to rely on such a scrappy goal. They were profligate in front of the net, with only three shots on target out of 24 as Gray drew two solid saves from Foxes keeper Kasper Schmeichel. Record-signing Robbie Brady was unveiled to the home crowd at half-time, with Ashley Westwood also arriving on a busy transfer deadline day for Dyche's side, who now look to have the strength in depth to ensure their survival. Leicester have now suffered three straight Premier League defeats for the first time under Ranieri, marking the lowest ebb of the Italian's reign. The outline of that thrilling title-winning team remains, with Riyad Mahrez looking bright at times on his first start since returning from the Africa Cup of Nations and Jamie Vardy's pace causing Burnley problems. But too often they are simply chasing shadows. In the 21st minute, Vardy raced onto Matthew Lowton's loose back-pass only to fire a dreadful effort off at a right-angle and out for a throw-in, while Robert Huth and Wes Morgan were menaced by Burnley striker Gray. That wastefulness and defensive frailty were not evident last year. A 2-0 win over Sunderland at the Stadium of Light in April during that dizzying run to the title was the last time Leicester won away in the Premier League, in a season where they topped both the home and away tables. The Foxes are now firmly at the other end, just two points above the relegation zone and desperately looking for answers, with Leonardo Ulloa's dispute with Ranieri perhaps hinting at further problems behind the scenes. Rightly or wrongly, much of the discussion of this game will again centre on the performance of referee Dean, in particular his decision to allow Vokes' late winner to stand. The ball undoubtedly struck the Wales striker's hand, but Dean either did not see it or adjudged Vokes' movement towards the ball not to be intentional. "It was a handball - it was for everybody, for the television, but not for the referee," said Ranieri. Although the most significant moment, that late decision will not be the only one debated. Dean, who has awarded the most penalties of any referee this season, judged that Burnley keeper Tom Heaton did not foul Vardy in the area on either of their two collisions. Burnley will feel they also deserved a penalty before the break for a push by Danny Drinkwater on Keane, but Dyche was unwilling to dwell on Dean afterwards. "If we did get a scratch of luck people wouldn't say it was underserved as we've had a few things go against us this season," said Dyche. Burnley boss Sean Dyche said: "I'm very pleased and we deserved it - we were constantly knocking on the door against a good side. "We finally broke them down and scored a good goal to win it - I think it comes off Sam Vokes' stomach first then his hand but you could suggest we could've had a penalty - there was a nudge in Michael Keane's back. "We want Ashley Westwood and Robbie Brady to add to the quality of the team, we just wanted to bolster the group, while Joey Barton is applying himself well, as he always has done at this club." Leicester boss Claudio Ranieri said: "The referee is the boss, he didn't see it and we lost - in this moment everything is wrong against us, including the decision of the referee. "We have a problem scoring goals and we conceded a goal and we have to react. "Our target from the beginning is 40 points and we have to fight from this point." Burnley have now won nine Premier League games in 2016/17, their most in a single season in the competition (previous best was seven in 2009/10). Leicester have taken just 21 points from 23 games this season; the worst ever total at this stage of a campaign by a reigning top-flight title-winning club. Leicester have failed to score in four consecutive league games for the first time since November 2014 (five, under Nigel Pearson). Burnley fired in 24 shots (including blocks) against Leicester; their most ever in a Premier League game. Despite that, they had just three on target, with the first of those arriving in the 53rd minute. Joey Barton made his first Premier League start since May 2015 (also against Leicester, for QPR) - 618 days ago. Burnley travel to face Watford at 15:00 GMT on Saturday, while Leicester host Manchester United at the King Power stadium on Sunday, with kick-off at 16:00 GMT. Match ends, Burnley 1, Leicester City 0. Second Half ends, Burnley 1, Leicester City 0. Corner, Leicester City. Conceded by Joey Barton. Attempt blocked. Riyad Mahrez (Leicester City) right footed shot from outside the box is blocked. Attempt saved. Ahmed Musa (Leicester City) right footed shot from outside the box is saved in the top left corner. Assisted by Jamie Vardy. Substitution, Burnley. James Tarkowski replaces Jeff Hendrick. Goal! Burnley 1, Leicester City 0. Sam Vokes (Burnley) left footed shot from very close range to the high centre of the goal. Assisted by Michael Keane with a headed pass following a corner. Corner, Burnley. Conceded by Robert Huth. Attempt missed. Sam Vokes (Burnley) right footed shot from the left side of the box is just a bit too high. Assisted by Stephen Ward with a headed pass. Attempt saved. Ahmed Musa (Leicester City) header from the centre of the box is saved in the top left corner. Assisted by Danny Simpson with a cross. Attempt saved. Andre Gray (Burnley) right footed shot from a difficult angle on the right is saved in the bottom left corner. Assisted by Tom Heaton. Substitution, Leicester City. Shinji Okazaki replaces Marc Albrighton. Attempt missed. Ashley Barnes (Burnley) header from very close range misses to the right. Assisted by Scott Arfield with a cross following a corner. Corner, Burnley. Conceded by Daniel Drinkwater. Attempt blocked. Andre Gray (Burnley) header from the centre of the box is blocked. Assisted by Joey Barton. Delay in match Jeff Hendrick (Burnley) because of an injury. Attempt missed. Ben Mee (Burnley) header from the centre of the box is just a bit too high. Assisted by Scott Arfield with a cross following a corner. Corner, Burnley. Conceded by Wes Morgan. Attempt missed. Ashley Barnes (Burnley) left footed shot from outside the box is too high. Assisted by Stephen Ward with a headed pass. Attempt blocked. Jeff Hendrick (Burnley) left footed shot from outside the box is blocked. Assisted by Andre Gray. Attempt blocked. Michael Keane (Burnley) right footed shot from the centre of the box is blocked. Attempt blocked. Andre Gray (Burnley) right footed shot from the centre of the box is blocked. Corner, Burnley. Conceded by Danny Simpson. Substitution, Leicester City. Ahmed Musa replaces Demarai Gray. Attempt blocked. Jamie Vardy (Leicester City) header from the centre of the box is blocked. Assisted by Riyad Mahrez with a cross. Attempt missed. Ben Mee (Burnley) header from the centre of the box misses to the right. Assisted by Scott Arfield with a cross following a corner. Attempt blocked. Riyad Mahrez (Leicester City) left footed shot from outside the box is blocked. Assisted by Demarai Gray.